Kee Facts: An American Rebellion, Sparked By Tough Times Times are hard. The economy's a mess. Citizens are frustrated with the government. Politicians make speeches, but nothing seems to change. People object to having the nation's debt on their shoulders, and they take to the streets to show their anger. The Tea Party in 2011? No, Shays' Rebellion in 1786. A war is ending and economic times are tough. Taxes are high and property foreclosures common. Streets are filled with protesters. Sounds familiar, I know, but I'm not talking about today's news. It was the Revolutionary War, winding down in 1783, and the national government was massively in debt and having enormous difficulty paying the soldiers who had fought the war. Robert Morris, superintendent of finance, had scraped together one month's salary for each veteran; the rest of their back pay was issued in scrip, redeemable at some future unspecified date. But the men needed cash quickly, to pay their own debts on the homes, farms and shops that they had been unable to maintain during the war. Many sold their scrip to speculators and their money ran out fast; local courts began foreclosing on those unable to pay their debts. In late August 1786 — 225 years ago this week — the Massachusetts government called out the militia to protect the courts from debtors who had banded together to stop the foreclosure procedures; a tense standoff followed. War veteran Capt. Daniel Shays and the protesters closed down the Springfield courthouse in September. The following January, the unrest broke into open rebellion, when Shays marched more than a thousand debtors to the arsenal at Springfield, hoping to acquire arms so they could force the government to act upon their grievances. But the state troops arrived first, firing cannon as the protesters approached, killing four and wounding many more. Shays and his men dispersed, and although there were a few minor skirmishes in the following weeks, the rebellion was effectively over. 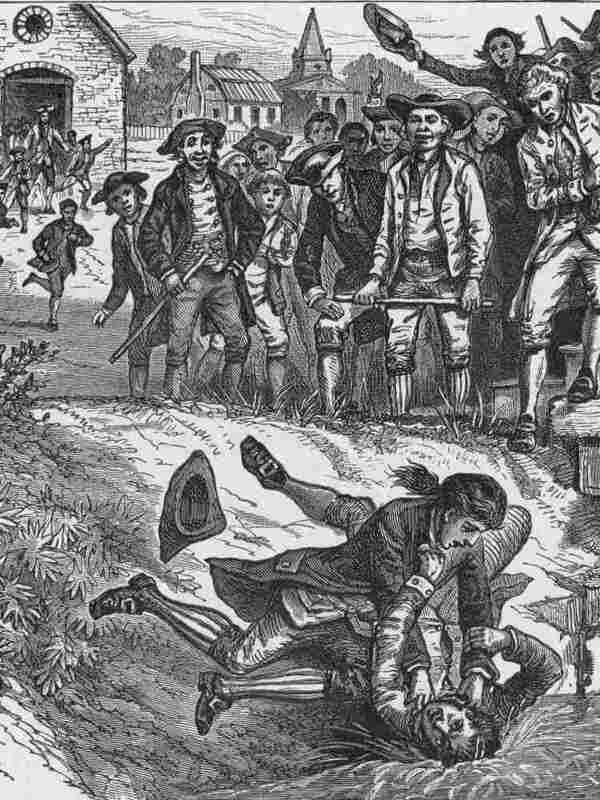 National leaders were greatly disturbed by Shays' Rebellion, and it gave substantial impetus to those seeking a strong federal government during the crafting of the U.S. Constitution at the Philadelphia Convention that summer. Shays escaped to Vermont, was pardoned for his role in the uprising, and eventually received a pension for his war service. Thomas Jefferson — then the American ambassador to France — was writing about Shays' Rebellion when he penned this oft-quoted sentence: "The tree of liberty must be refreshed from time to time with the blood of patriots and tyrants."